Respected community group, Citizens for Detroit’s Future, headed by prominent Detroit accountant and former mayoral hopeful Tom Barrow, in letters to members of the Detroit City Council called on members to reject outright the proposed State lease ceding control of Belle Isle to conservative state interests or place the matter on the August Ballot for a decision by the city’s residents. The success of this grand robbery is dependent on organizing an “inside job” and having allies to keep a “back door” open for an efficient undetected raid. Already electorally compromised in 2009, (the County Board of Canvassers held that nearly 60,000 ballots cast for mayor could not be recounted including the entire class of Absentee Voters, because seals on cases had been changed after election night), the Mayor and six council members seemingly operate openly against the overwhelming voices of their constituents, vote against city resident’s interests, make collective decisions in violation of the Open Meetings Act and the City’s Charter, and meet privately to agree and sign off on deals with no public hearing or notification. Unfortunately, left to the Council of Six, the ceding of Belle Isle will be a done deal. It is as much so as the forced hiring of Miller Canfield and the sale of hundreds of east side acres to a Hantz Farms Group despite massive overwhelming community opposition. Other than Detroit’s Water System, which will certainly be next, the ceding of Belle isle will be the apex to a well-orchestrated less-than-transparent plan to strip Detroit of its valuable assets and resources. “If there ever was a robbery in broad daylight for which we need the police, it is ‘The Great Detroit Jewel Heist’ the mother of them all, a theft which will not be forgiven” said Barrow. 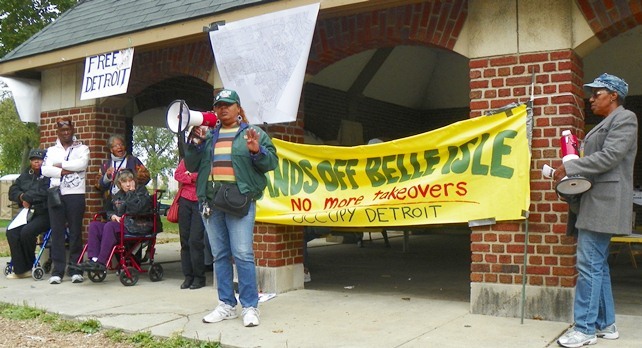 CFDF cautions state interests about over-reach as the taking of Detroiter’s Belle Isle will be seen by many city residents as racially motivated and drive a REAL wedge between Detroit and its neighbors. 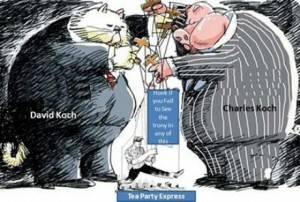 But race, as overarching a concern as any in matters of Detroit, is over-shadowed by the specter of the billionaires (Koch brothers, Walton and Devos families) who quietly orchestrate moves like these which include voter suppression, emergency managers, and right-to-work laws, all that build upon a worldview that profit-oriented elite business and political interests control our democracy at their whim. 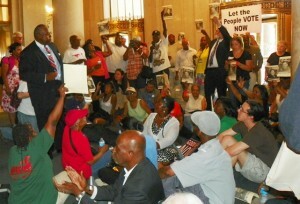 Ralliers at Cadillac Place demand “Let the People Vote’ on PA 4. City officials’ brazen lawlessness and weakness emboldens the state’s governor and the billionaires to run roughshod over the Detroit citizenry using the cover of votes by the Six. In effect, our “selected” Mayor and Council of Six, act as “loyal employees” to collaborate and conspire openly with outsiders to rob the city’s residents. A question which must be asked is where are Detroit’s highly touted mayoral hopefuls? They seemingly always sit quiet whenever a fight needs Commanders and Generals, when their community cries out for its defenders, where are they with their swords and shields? Where are our state legislators with their raised voices of protest and determination to right wrongs when sheep clothed enemies come at us? Stand up!! Being silent will not make them like you and not make them stop coming at us. With whom do you stand, Detroiters or its Destroyers? What the people of Detroit do not get is the whole state of Michigan wants Detroit to be revived and back to its glory. How do suggest we bring life back to the city? You cut down all major investors in project with no evidence other than your opinion. The deal for Belle Isle was a 10 year agreement in which the state would pay to fix up the decaying island and they could then opt out after. Instead it will now sit and rot just like the rest of the city because citizens are convinced that the white devil is trying to rob them blind. Spend 1o minutes in an economics class and you will realize that if money goes into the city people will go there, which will bring jobs, which will bring residents, which will bring grocery stores, malls, and so much more. The city is dieing and articles like this do nothing but speed up its death.